Toys I think are cool. I've collected various toys over the years. The ones I choose either have an interesting design, are quality implementations, or are just remind me of a piece of media that I like. I only get a couple of toys a year these days. Most of my toys are in six glass IKEA display cases to keep them out of the way and organized. The rest are on shelves, bookcases and my desk. 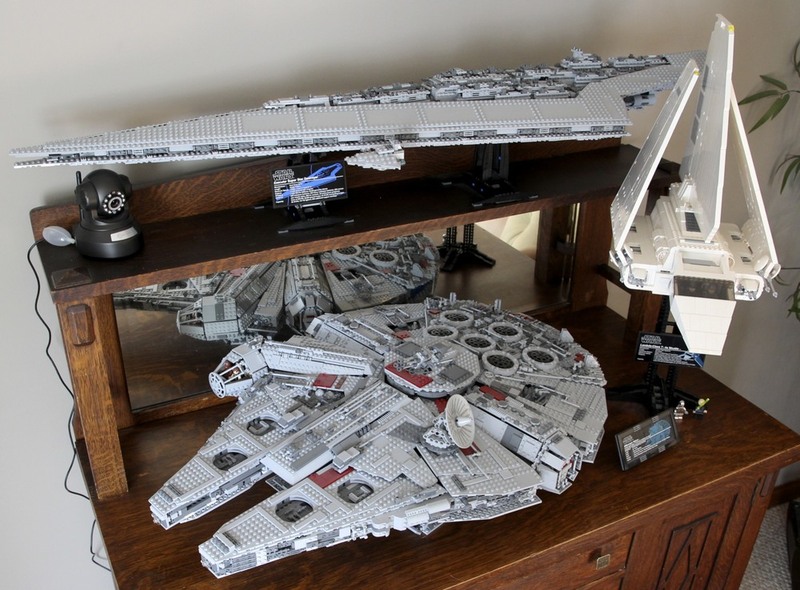 Save for a few large LEGO sets in the living room, and a Serenity in the bedroom, they are all in my office. I've also modified some of the toys featuring battery-operated lights so that they instead use hardwired power, thus allowing the lighting can remain on all the time. The main collection, stored in and around six IKEA display cases. Hardwired power on The Dark Knight Batpod and TRON: Legacy Light Cycle. I'm a fan of many of the designs in the Star Wars universe, especially the vehicles. One of my display cases is devoted to just these toys. I used to have more (such as figures), but I thinned them out over time to just the ones I liked the most. Action Fleet vehicles, all of which came with small figures. These are all from the early 2000s, around the time the prequel movies came out. Smaller Die Cast and Plastic Vehicles. I don't quite remember how these were branded, although I'm sure at least some are Micro Machines. These are all from the early 2000s. Hot Wheels and Hasbro Die Cast and Plastic Vehicles. These are from the Disney Star Wars movies, such s Rogue One and The Force Awakens. Action Figures and Vehicles: I don't have too many of these. I had a lot more when I was a kid, but they were quite large and often missing poses, so I sold them. Again, these are all from the early 2000s. Larger Figures. Only one of these (so far...). AT-ST, B-Wing, Snow Speeder, Jawa Sand Crawler, Cloud Car, Speeder Bikes, Bantha, etc. Republic Starships, Naboo Starfighter, Droid Transport, etc. AT-AT, X-Wing, Slave I, Y-Wing, Millenium Falcon, etc. Imperial Shuttle, Replublic Gunship, Jawa Sand Crawler, TIE Fighter, Land Speeder, Doird Battletank, etc. My bother and I had a larger collection of first generation (aka Generation 1, or G1) Transformers, but we sold most of them; they had been heavily played with and weren't in the best condition anymore. I kept a few, and bought some re-issues and newer designs as well. Megatron, Thrust, Soundwave, Laserbeak, Ravage, Insecticons, Micro Transformers. 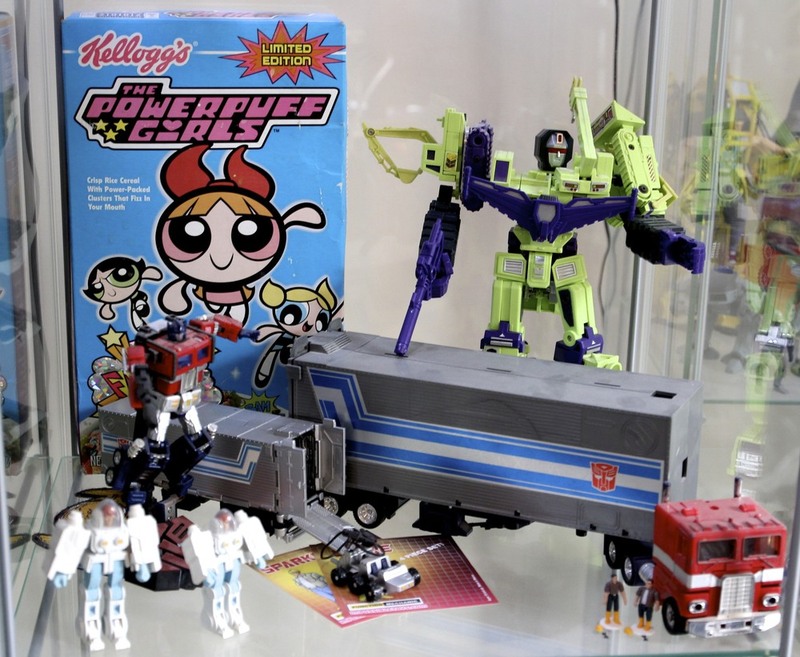 Powerpuff Girls Cereal, Devestator, Optimus Prime, Original Optimus Prime, ExoSuits, Spike and Sparkplug. Super-Mini Transformers. These were released as blind boxes in the early 2000s in Japan. Each is a tiny version of a G1 Transformer, and is fully transformable using a similar (if not identical) transformation sequence. I also have a Diacron/Diaclone similar to Sideswipe (a red Lamborghini Coutach). This was the original toy line that later made up many of the Autobots, and included tiny figures with magnetic feet to pilot the (non-sentient) vehicles. My brother and I had a large collection of 1980s era 3.75" GI Joe toys, including the really big toys like the Defiant Space Shuttle Complex, the Terror Drome, and the massive USS Flagg Aircraft Carrier. We've since sold the vast majority of them; I kept only the motorized MOBAT tank, and bought the brown AWE Striker and Sky Hawk re-issues -- the latter of which we never had, but which I always liked the design of. GI Joe AWE Striker, Sky Hawk and MOBAT. Batpod, TRON Legacy Light Cycle, LEGO Ghostbusters ECTO-1 and ghost trap. I also have some of the more recently released (2014-2015) Batman: The Animated Series and Batman Beyond toys from DC Collectibles. These have a lot more articulation, detail and accessories than the older early 2000s figures above. I also hardwired power to the Batmobile so that the lights can stay on all the time. DC Collectibles Batmobile with the lighting hardwired to a plugged-in power source. Tron Legacy Lightcycle, WALL-E, Batman, Two Face, Clayface, Mr. Freeze, The Creeper, Roxy Rocket (with rocket), Old Bruce Wayne (Batman Beyond), and Batman (Batman Beyond). Mass Effect SSVNormandy SR-1, Galaxy Quest NSEA NTE-3120 Protector, Robotech Konig Monster. Hitchhikers Guide to the Galaxy Marvin, Robotech Sumo Veritech, Firefly Serenity, Cowboy Bebop Swordfish II, Goldeneye Watch. Zim was a great show, and I have nearly every toy from the line. 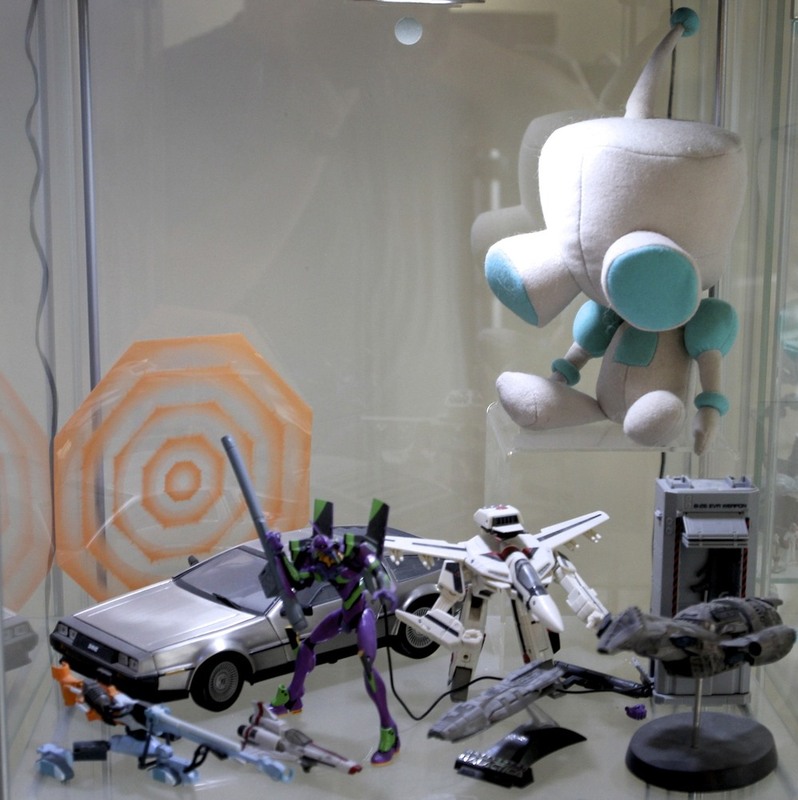 I also have a stuffed GIR robot figure, a stuffed GIR disguised figure, and a GIR that has a removable disguise. 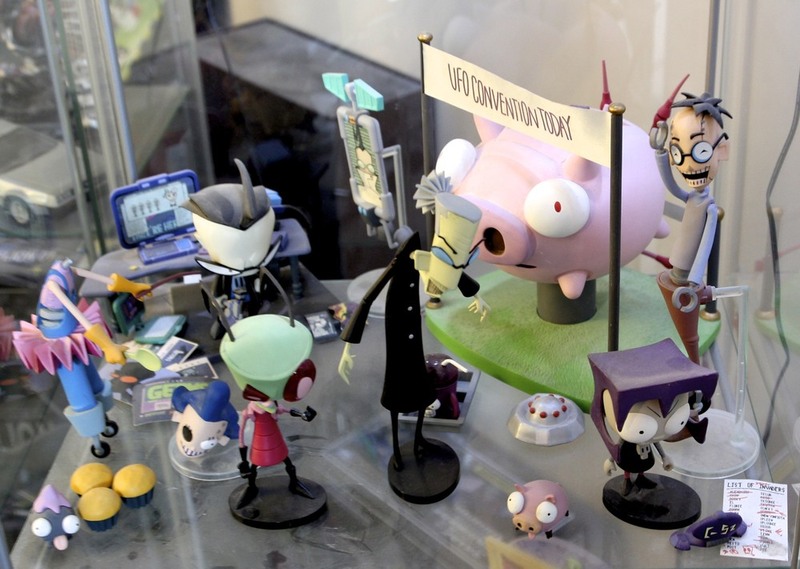 Dib's Room, UFO Convention, Robot Parents, Mrs. Bitters, Zim, GIR and Gaz. 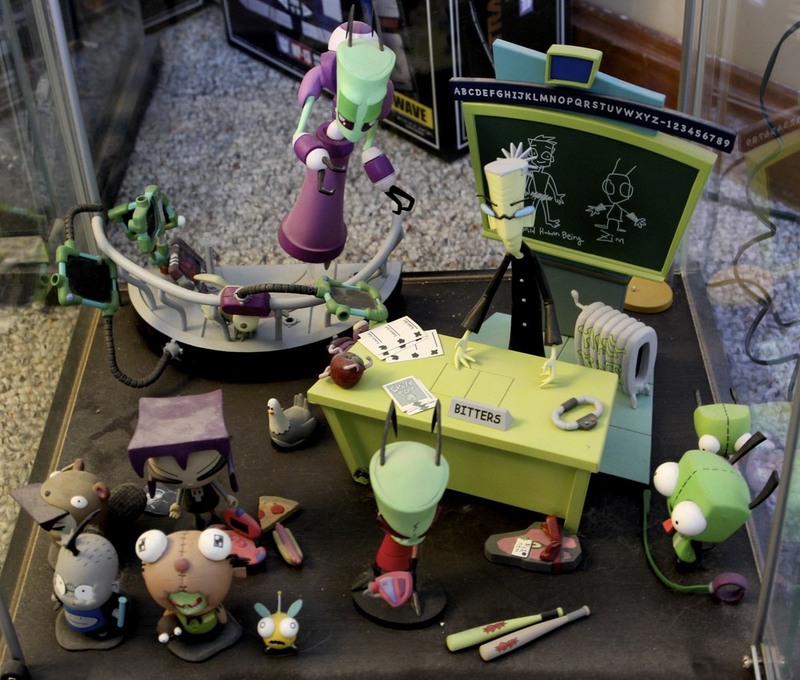 Almighty Tallest's Command Center, Mrs. Bitters' Desk, Gaz, Zim, GIR. Sandstorm, Time Machine, DeLoreans, Dogma Buddy Christ, Austin Powers Dr. 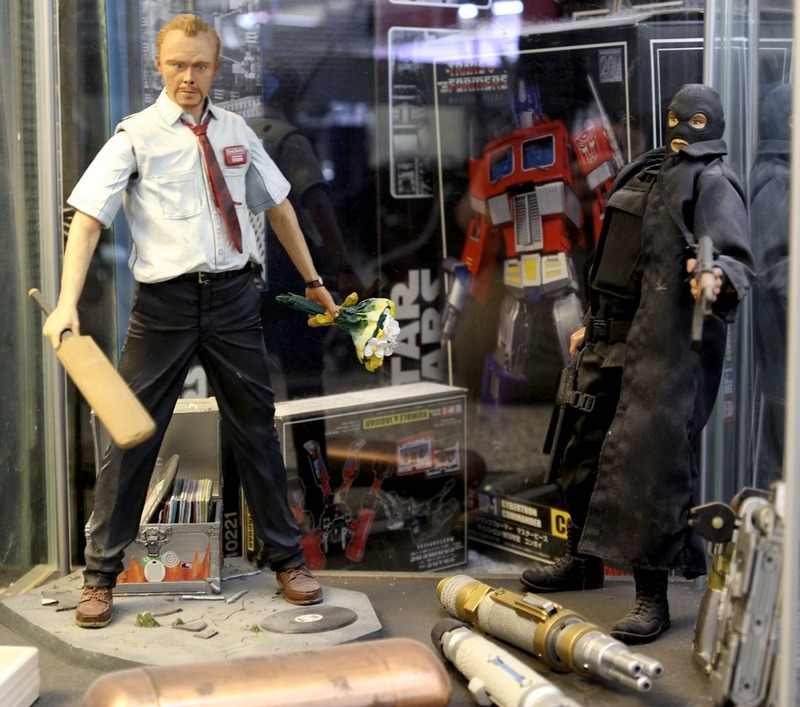 Evil, Clerks Figures, Fight Club Soap. 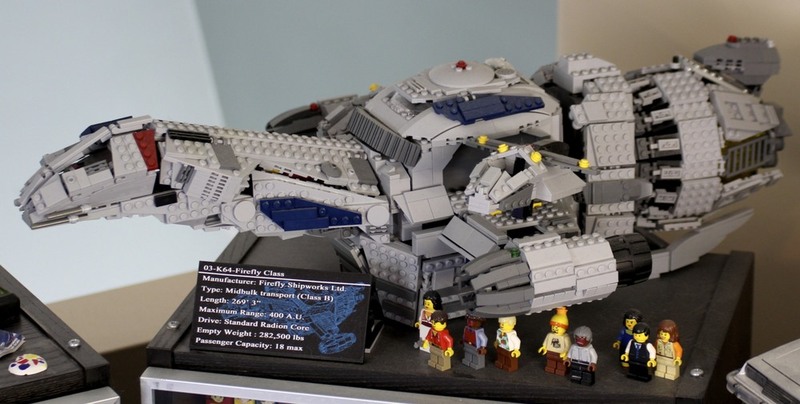 LEGO sets are quite fun to build, and some of the designs are rather clever. I only have a few these days, though, although for the most part they are quite large. A rather faithful adaption, complete with all four Ghostbusters. A large model with over 4500 pieces, opening to reveal a playset-style layout with a dozen characters from the movie. With over 5000 pieces, this was the largest LEGO set ever released at the time (and still the most expensive). It took me a bout a week to assemble, a day of which was just sorting the pieces. I just really like the design of the Super Star Destroyer. A pretty neat kit, with cranks to fold the wings. This is a fan made kit with over 2000 pieces that was available for a short time in 2012. The minifies and shuttles were sold separately, but I got them too. The kit is a rather well done replica with three rooms (kitchen, cargo bay and cockpit) and a lot of space inside. This design compromises the structure somewhat, and I had to glue key parts together to keep it solid (by contrast, the Millennium Falcon's interior is mostly heavy-duty structure so that it can support its own weight, but has basically no internal space). The drive section is also quite fragile (glue helped a lot), and features a light brick that makes the whole engine glow when activated. Plush Serenity, LEGO Ghostbusters and ECTO-1, and the Dark Knight Tumbler. 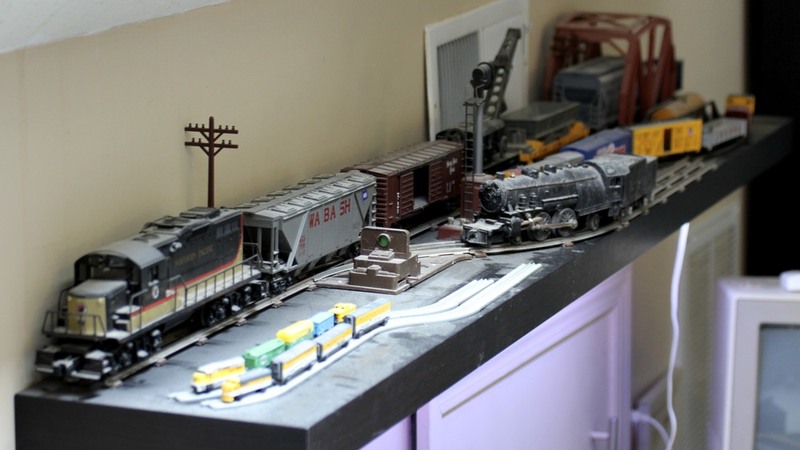 My brother and I would get a model train car each year for Christmas. I still have mine, as well as some smaller trains and my mom's childhood steam engine and coal car, which weighs around ten pounds by itself. They are currently displayed on a shelf, but not in a manner that they can be run. 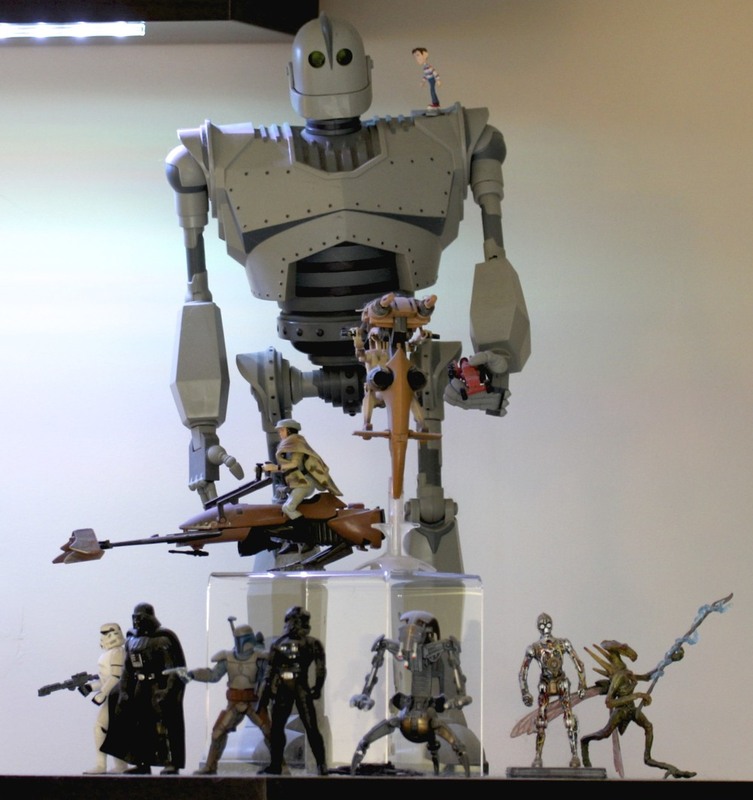 The Iron Giant, various toys of the title character, including one that stands two feet tall. Ghostbusters Stay-Puft Marshmallow Man, Batman vs. Clayface, and a Slinky. Iron Giant, Princess Leia on Speeder Bike, Battle Droid on STAP, Storm Trooper, Darth Vader, Jango Fett, TIE Fighter Pilot, Destroyer Droid, C-3PO and Geonosis Warrior. Ghostbusters ECTO-1, Lost in Space Robot, TRON: Legacy Light Cycle, Babylon 5 Spacecraft, C-3PO and R2-D2. 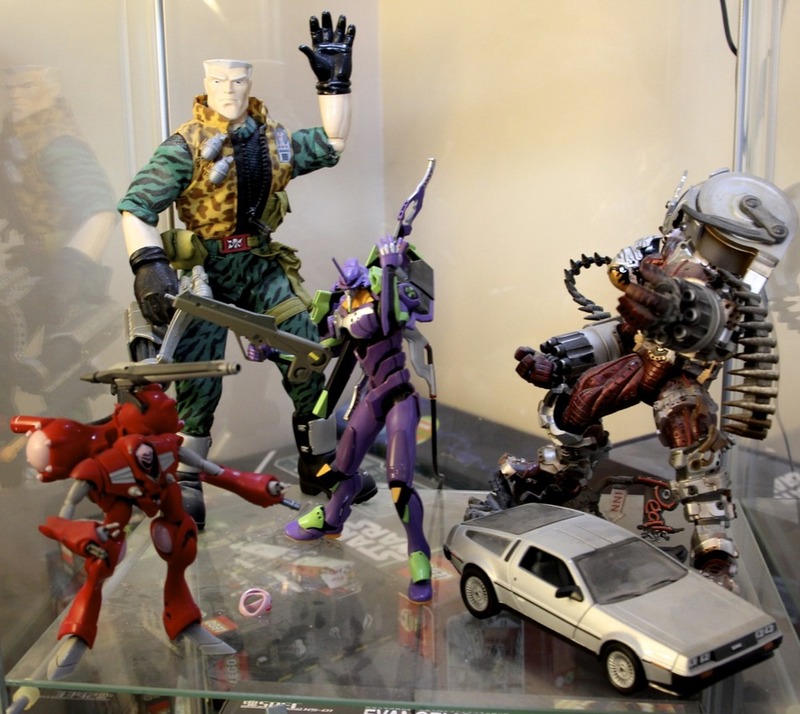 Small Soldiers Chip Hazzard, Evangelion EVA-01, Trigun's Monev the Gale, Robotech Queadluun Rau, DeLorean. Invader Zim GIR, DeLorean, Evangelion EVA-01, Robotech Veritech, Firefly Serenity, Battlestar Galactica Galactica and Viper. Army of Darkness Ash, Silent Bob, X-Files Cigarette Smoking Man, Family Guy Death, Mayor West and Stewie, Machete, Powerpuff Girls. Babylon 5 Starships, Starscream, Trigun's Vash the Stampede, Ghost in the Shell Tachikoma, Animaniacs Pinky and the Brain. Iron Giant, Voltron, Firefly Shuttle, EVA-01 vs. Angel, Zim's Command Center. YF-19. Wolfwood, Vash the Stampede, TRON: Legacy vehicles. Titanfall Stryder titan with CQB pilot, chain gun, rail gun and hard-wired LED lighting. 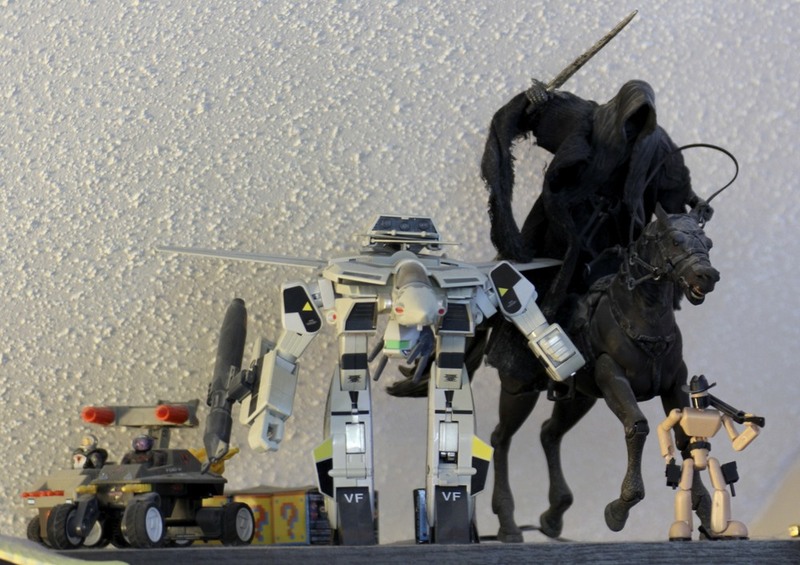 Toys based on video games designs. In particular, the Stryder titan from Titanfall was my preferred mech in that game, and I was pretty good with it, making it up to generation 10 with a rank of Platinum 3 (which probably means nothing to most everyone). I'm just disappointed that I couldn't get it with the arc canon. From the Portal video game series. From the video game Mass Effect. From the video game Titanfall by Respawn. Stands 18" tall, and includes a chain gun and rail gun for the titan, and a CAR SMG for the pilot, modified with hardwired power for the LEDs. Modified with hardwired power for the LEDs. I got this one because of the stupidity of this toy being banned in the late 1990s. It wasn't because of the ski mask, the assault rifle, the shotgun, or anything else -- it was because he was wearing a trench coat. From back when I played Battletech in middle and high school. I assembled and painted these, and built tiered terrain from styrofoam blocks to play with them on. From the anime Ranma 1/2. Half scale, which came with my purchase of the video game Dead Space. An old Chirstmas present from when I was a kid, these were (and still are, I believe) commonly sold at Hess gas stations. I used to have quite a lot of these, but eventually sold them all on eBay as a lot. I somehow missed this one, so I've kept him around. Just some old ones: a fluffy cat, a large blue rabbit, a bison, Snoopy, two small white seals and a grey seal. Besides the Nike DeLorean sneakers, I also have a few nostalgic T-shirts, some of which were made into throw pillows using ThinkGeek's T-shirt to pillow set (which they don't seem to sell anymore). I actually have two of these. The first is a dark grey with about twenty pockets sewn in by AbbyShot for me. The second one is black, and has just the standard pockets, which I'd sometimes augment with a Scott eVest. From the Nintendo 64 game, a Redittor figured out how to get these made for $7 USD. Yellow-tinted glasses with zig-zag frames and a metal carrying case from Trigun. I really liked this one, as it had a subtle Irkin logo on the front and no actual text saying "Invader Zim" or anything like that on it. I haven't been able to find a new one; the original was given to me by a friend at Nickelodeon. From the original Transformers series, these were produced by a third party in the early 2000s. Again, these no longer seem to be available. From when I worked on Turbine's Asheron's Call. Memorializing the death of Commodore, and by extension, the Amiga. These are still available from ErrorWear, and have the infamous system crash message on the front. These are pretty easy to find from a variety of sources, and feature the text Amiga on the front. Sean from Sean of the Dead, Armed Terrorist, Doctor Who Sonic Screwdrivers. Various T-shirts turned throw pillows and stuffed or plush toys.